This new chip uses the ARMv8-A architecture and is the world’s most efficient 64-bit mobile processor. 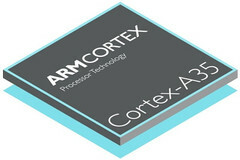 ARM announced yesterday a new processor, namely the Cortex-A35. This new chip uses the ARMv8-A architecture and, according to the official press release, is "the world’s most efficient 64-bit capable mobile processor" that will enable ARM and its partners to "deliver the benefits of 64-bit computing to the next billion smartphone users and beyond." When running 32-bit tasks, the Cortex-A35 provides an average performance increase of 20 percent over the Cortex-A7 while operating at 1 GHz in a 28 nm process mode and using less than 90 mW total power per core. Compared to the existing Cortex-A53 64-bit processor, the new Cortex-A35 uses 33 percent less power per core, also occupying 25 percent less silicon area. ARM partners should begin to deliver products that use Cortex-A35 chips "by late 2016," so MediaTek chips could get an interesting refresh next year. "The ARM Cortex-A35 processor is welcomed by MediaTek for its scalability of the ARMv8-A architecture, which will enable us to continue to provide efficient and highly integrated 64-bit SoCs to global markets," says Jeffrey Ju - the company's executive vice president and co-chief operating officer.